Junior Champion Ewe – under 1 ½ years old –Wahroonga Park Trophy, presented by K. & M. Moreton. Presented by the Family of the late R.H.R. Baker for award to the Champion shorn Corriedale Sheep of the Show. The Trophy to be won three times by the same exhibitor, not necessarily in succession. The Champion Shorn Sheep shall be eligible to compete for the Supreme Champion Corriedale award. Supreme Champion Corriedale – Wettenhall Perpetual Trophy valued at $200 and $200 from the Victorian Branch. Presented by the Trustees of the Estate of the Wettenhall Family (Janet, Darcy, Guy) to commemorate the Stanbury Corriedale Stud, 1952-1992, to the exhibitor of the Supreme Champion Corriedale. Also a Lyco Loader, kindly donated by Lyco Industries. Loddon Park (Vic), 1; Wye (SA), 2; Streanshalh (Tas. ), 3. Gambier View, 1; Haven Park, 2; Quamby Plains, 3. Loddon Park, 1; Haven Park, 2 & 4; Wye, 3. Class 235 – Pen of 2 rams any age. Liberton, 1; Gambier View, 2; Quamby Plains, 3. Haven Park, 1; Gambier View, 2; Corriedale Hills, 3. Liberton, 1; Wye, 2; Corriedale Hills, 3. Liberton, 1; Loddon Park, 2. View, 1; Loddon Park, 2. Wye, 1; Haven Park, 2; Loddon Park, 3. Class 243 – Objective Measurement Class – Ram any age with minimum of 6 weeks wool Lambplan EBV’s to be supplied. The Coora Trophy, presented by Coora Partnership, will be awarded to the winner of the Objective Measurement Class. Coora, 1, 2 and 3. Gambier View, 1 and 2. Gambier View, 1; Liberton, 2; Loddon Park, 3. Wye, 1; Elisabeth Murdoch College, 2. Liberton, 1; Gambier View, 2; Loddon Park, 3. Wye, 1; Campbell Springs, 2; Liberton, 3. Loddon Park, 1 & 3; Wye, 2. Class 250 – Ewe any age, with her own progeny at foot – or visibly in lamb. Loddon Park, 1; Gambier View, 2; Wye, 3. Loddon Park, 1; Gambier View, 2. Class 255 – Group of 2 Corriedale Rams and 2 Corriedale Ewes – age open i.e. 1 Ram and 1 Ewe in the Wool and 1 Ram and 1 Ewe closely and evenly shorn, to be drawn from the ordinary classes. Wye, 1; Gambier View, 2; Loddon Park, 3. 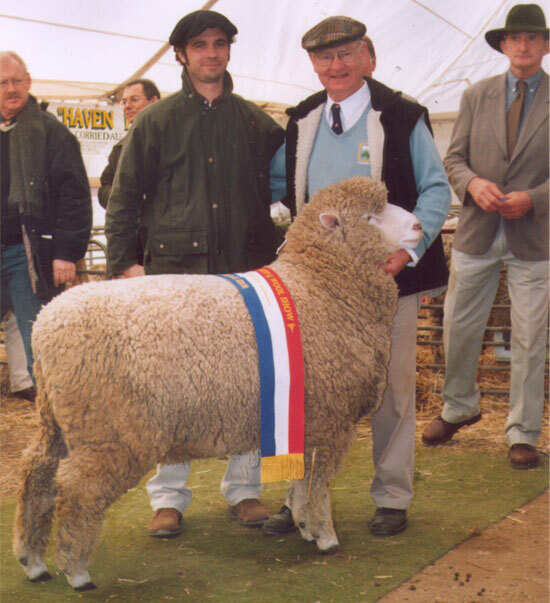 Class 256 – Ken Smith Memorial Trophy for Corriedale Sires Progeny Group to consist of 3 sheep; Rams and/or Ewes any age, the progeny of one sire, to be drawn from the ordinary classes. Class 257 – R.E. Wettenhall Trophy for the Best Head – on a Corriedale Ram at the Show. A Trophy valued at $100 will be presented to the winner. The exhibits to be drawn from any ram class and to be judged by the Ram Judge. Exhibits must be in the wool and due regard must be taken by the judge to ensure that the exhibit is a reputable Corriedale in all aspects, but the prize is to be allotted to the Best Head. Presented by Mrs. Barbara V. McFarlane and Mrs. Beverley Baker for award to the Best Corriedale Sheep exhibited by a first year Exhibitor, to be drawn from ordinary classes. A Trophy valued at $40 will be presented to the winner. The J.F. Guthrie Perpetual Cup – Most Successful Exhibitor in the open Corriedale classes.